One of the worst things about aging is the lack of control we now have over our own bladders. If you have this problem then you know exactly what I am talking about. It’s so hard to feel confident and in charge when you are worrying about something like incontinence. It hits at the worst possible moment. A small cough or a little giggle can send us racing to the bathroom. I have had this problem since the birth of my youngest. I had an emergency C-section and every since I have had to constantly worry about things like water intake, where restrooms are located, and if I had everything I may need to take care of the problem every single place I go. Talk about an ego buster! It affects your emotional state, your body image, and your sexuality. I was doing some research on incontinence because frankly I am tired of carrying around extra clothes and piles of period pads that just don’t work. I thought I would share what I found with you because I know I’m not the only one tired of dealing with this! Over 51 million Americans suffer from bladder leakage that is 1 in every 3 women! Depend brand has introduced Depend Silhouette Active Fit briefs, a new moderate-absorbency brief that features a thin design for complete comfort with the trusted protection of the Depend brand and a lower rise for an underwear-like look, fit, and feel. Encouraging people to show their support for women with bladder leakage. For every photo and video shared using #Underwareness, the Depend brand will donate $1, up to $3 million, through 2016 to fund charities that advance the research and education of bladder leakage. Join the movement and request a free sample of Depend Silhouette Active Fit briefs at www.depend.com/products/get-samples. Together, we can show that wearing a different kind of underwear is no big deal. In year two of Underwareness, the brand’s social movement and charitable cause to break down the bladder leakage stigma, Depend is joining forces with CVS Health to support women with bladder leakage as they navigate their path to better health. Visit www.cvs.com/depend to learn more about Depend Silhouette Active Fit. To join the Underwareness movement, go to www.Underwareness.com. STRESS INCONTINENCE– This happens when you cough, laugh, or sneeze. (When you put too much pressure on your bladder). Stress incontinence can result from pregnancy and childbirth and it is the most common. Pelvic muscles get stretched and damaged. URGENT INCONTINENCE– This is sometimes called “overactive bladder”. You have an urgent need to go followed by and involuntary loss of urine. This is due to spasms of the bladder muscles. MIX INCONTINENCE– This is basically when you have both kinds of the incontinence mentioned above. OVERFLOW INCONTINENCE– When you can’t empty your bladder every time and experience a frequent and constant dribbling of urine. This can be caused by lots of things like medication, nerve damage, from diabetes, impaired bladder, muscle contractions or bladder obstructions. Caffeine is considered a diuretic and can also make you leak more. There are medications that can be taken or there are also other treatments. The very first thing you need to do is to have a real conversation with your Dr. Believe me, I know this isn’t easy, but suffering in silence isn’t smart either. 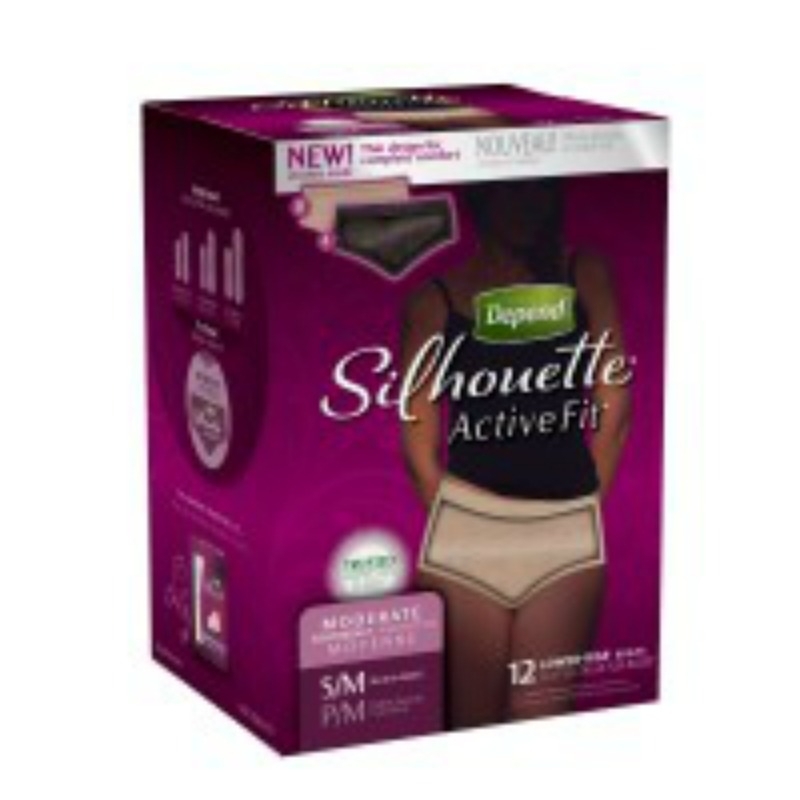 There are products that can make your life a lot easier like DEPENDS SILHOUETTE ACTIVE FIT. I’ve always stuck with “period pads” but they just aren’t enough. They don’t give me the confidence I need. So, I will be trying these out for the next month to see how they fit and whether they are something that I would actually use. I’ll let you know next month what I think of them! I am participating in a Vibrant Influencer network campaign for the Depend brand. I am receiving a fee for posting; however, the opinions expressed in this post are my own. I am in no way affiliated with Depend and do not earn a commission or percent of sales. This is one problem I have never had but am always waiting for! It’s great that there are such unobtrusive answers! Thanks so much Pia! I wish I didn’t have to worry about it but it’s something I always have to be prepared for! I’m relieved to say I don’t have this problem either (despite giving birth to two enormous babies!) It’s good to know what’s out there for when the need arises – as I’m sure it probably will down the track – glad you were brave enough to tackle it! Leanne@crestingthehill recently posted…feeling a bit crazy! ~ I bought a bike! Thank you so much that would be fabulous! Thanks Tina! I have had this problem since my late 20’s and because of my chronic illness it has gotten worse. Mainly when I am having a flare up. I had always used period pads but they just don’t work well so I decided to try these and so far so good. It’s not something that I have to use everyday but some days they come in handy. Excellent information — I will definitely pass it on but am glad to say it is not a problem for me. Carol Graham recently posted…Love at First Sight – Can it Last? Although i’ve never had this problem, I know you’ve helped many people Rena with your post. DEPENDS SILHOUETTE ACTIVE FIT sound like a great solution. Thanks so much Nancy your support is aways appreciated! Thanks, Rena, for excellent advice on a subject we don’t like to discuss. I don’t want to be fearful every time I laugh or sneeze – which is often! Me too! It’s nerve-wracking but this seems to be one answer to the problem! I think of how my mother coped. Wouldn’t she have loved the modern conveniences created for matters of inconvenience. dltolley recently posted…Treasure. And Vegetables. It’s the sneezing that does me in. I love the title for this post. This issue effects such a large portion of our population, and yet, no one wants to hear about it. Thanks for bringing it up! Thank you Jennifer! It’s definitely not a conversation most women want to have! I’ve been fortunate to not suffer from this yet, but my poor mom has a terrible time. She really needs to have surgery but keeps putting it off. I will forward this info to her – great post Rena! Thanks so much Lana! I hope it helps her! I remember walking the grocery store aisles with a dear friend of my parents. She was 70 and I was 17. “Where are the pads, dear?” I was so embarrassed and beyond puzzled. Surely she was beyond child bearing years? My dad explained her need for pads later that night. How great that there is a proper product now for this very common problem. You are carrying on the job and doing a wonderful service by writing about it here. Thanks Kelly! I was so happy to finally find you again and to think I found you wandering the streets of Seattle haha! Great info and a fab solution. I should pick some up before I head to visit my grandsons as jumping on the trampoline with them is THE trigger for such things, resulting in me doing a mad dash to the restroom. Good idea Lisa! Don’t let anything get in the way of Grandma time! I love how this is no longer an embarrassing topic. And dare I say, the design isn’t bad. I have an Aunt who has had this problem for years so I am going to share this post with her. Thanks so much Danielle! I hope they work for her! Thanks Rena for providing so much useful information, so helpful. The situation that always makes me shake my head in wonder is when a trainer (usually male) asks a mid-life woman to do jumping jacks. REALLY??? Are you kidding me? Haha! That’s hilarious Kimberly but I can see the dilemma for sure! I’m glad you enjoyed it…well found it useful haha! Wow! Really good to know that there are things we can do about this problem. It is indeed something that most of us don’t talk about but really should be addressed. Thanks for taking it on! Thanks Kathy! I’m so happy you found it useful. It is definitely a conversation we tend to stay away from. As always, you have done good research, and provided your reader with the facts. I have noticed a trend of courageous bloggers tackling a number of “sensitive” topics that people would benefit learning more about. Good for you, Rena – for being one of them. Thank you so much, Susan! I really appreciate your comments and especially your support!